You have been BEGGING for more Fun Flakes, so here is my twist on Autumn Flakes! 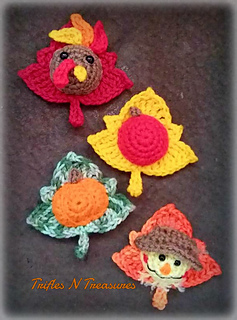 Four cute autumn themed designs on~what else? A leaf! 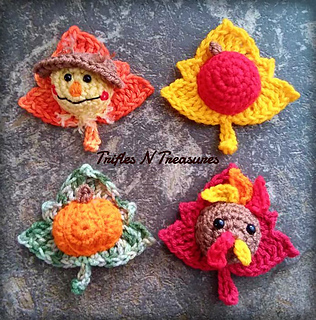 You get the Apple, Scarecrow, Turkey and Pumpkin, to brighten your autumn decor! How fun are they?? Finished models measure 4.5” high (including stem) x 4.5” wide, using worsted weight yarn. Dig through your stash pile to use up your scraps, and you can vary the finished size, depending on yarn weight and hook size!